In May 2015 Samantha received the devastating diagnosis, when doctors told her that she had undifferentiated nasopharyngeal carcinoma in her sinuses and lymph nodes. The British doctors also suggested IMRT which is conventional irradiation. However, Samantha and her family had known that this treatment could leave her with brain damage, and loss of sight and hearing, due to the close proximity of her brain, eyes and ears to the affected area. At that time, they researched her condition on Internet and came across the advanced option of irradiation by proton beam. Naturally, the family contacted the NHS about Samantha’s treatment. They received a negative reply. Mr Williams added: “The differences in the two types of treatment are like comparing the after-effects of a ‘smart’ bomb, to a ‘carpet’ bomb – laying waste to everything around the targeted area. It’s a disgrace proton treatment isn’t offered on the NHS“, continues Mr Williams. He is also disappointed with the overall approach of the British specialists. “All except one diminish the value of protons. That’s why we have to go to Prague to receive treatment. It costs £65,000 overall, lasting eight weeks” concludes Mr Williams. She has only mild side effects after treatment as a red skin and dry throat but she know this is nothing compared to what could have been the possible long-term or chronic side effects. 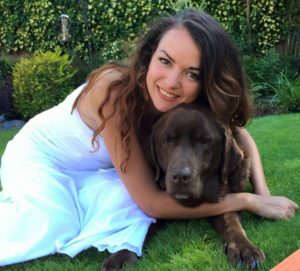 “I am grateful for choosing your centre, The UK Proton Therapy team was so supportive from the day one,” says smiling Samantha. “I’m amazed at the kindness and generosity of people so far, I’ve been moved to tears. Despite the difficult times, I felt completely in control of the situation thanks to them. My family was on my side every single day from my 38 visits for proton treatment”, says Samantha.